[2 mins. 45 secs.] Onur Tukel's comedy, "Richard's Wedding", is the focus of this episode of Filmwax Radio. Among the guests are filmmaker Onur Tukel, and co-stars Dustin Defa, Josephine Decker and host Adam Schartoff. Co-star Jennifer Prediger also participates in a phone call. The film is being distributed by Factory 25. 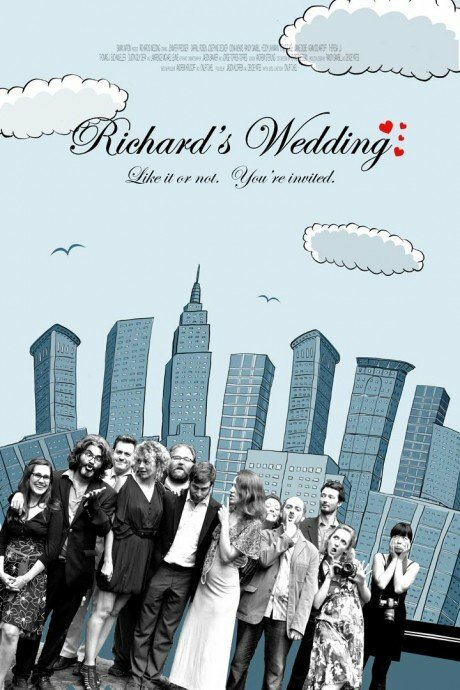 "Richard's Wedding", is an irreverent, often politically incorrect and ultimately touching film that plumbs the depths of friendship and marriage. The film follows Tuna and long time friend, Alex, on their quest to go to Richard's wedding in Central Park. The duo meet up with their motley assortment of old friends only to revive old jealousies and debates on politics, religion, and the meaning of success, as the whole party runs the risk of going off the rails in a downpour of rain and emotions. This re-tooling of the wedding-movie genre recalls classic ensemble films from the 1970's with a slew of New York indie-film talent, including writer/director Onur Tukel ("Septien"), Jennifer Prediger ("Uncle Kent") Oona Mekas ("The Future"), Darrill Rosen, Josephine Decker ("Art History"), Lawrence Michael Levine ("Gabi on The Roof in July") and Dustin Guy Defa (director of "Bad Fever"). This episode was recorded at BBox Radio.